Ayoora is the PUP that uses misleading techniques to prevent removal. Use Reimage to locate malicious components and get rid of them faster than with uninstall instructions. A full system scan blocks virus reappearance and prevents traffic to malicious domains. How could Ayoora affect my computer? Ayoora is classified as an adware type potentially unwanted program. 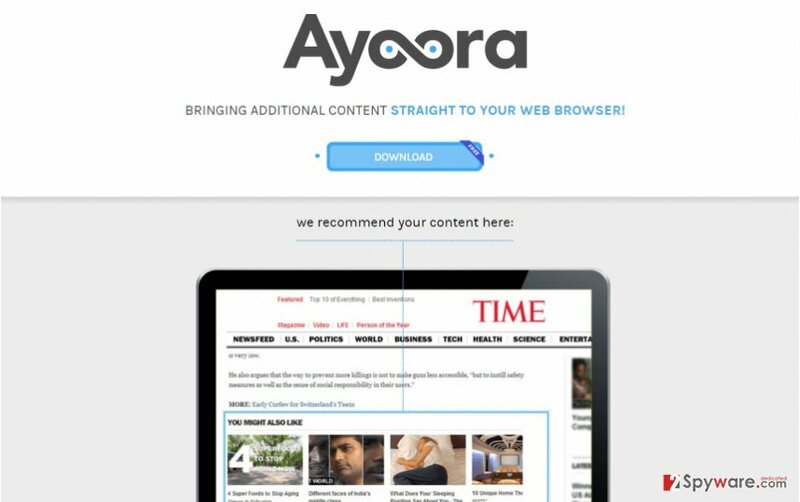 Ayoora web page, which was created in 2013 guarantees to „bring additional content straight to your web browser“. It is supposed to show you segments with suggestions for articles, videos, or slide-show that may be interesting for you. This program does not have an official installer anymore, but it is still being spread by third-party distributors. Even the fact that this program does not have an official distributor already makes it look suspicious and unreliable. Moreover, if you have accidentally installed Ayoora, you should have noticed various Ayoora ads showing up while you use your Internet browser. Ads by Ayoora usually suggest you incredibly great deals, giveaways, software updates or surveys. Be mindful and try to avoid such attractive-looking ads. We have to inform you that if you click on these advertisements, they may redirect you to malicious web pages, or even automatically start an installation of an infectious computer parasite program. In most cases, none of these advertisements are beneficial. The only way to clean your Internet browser from such ads and protect yourself from unreliable content is to remove the adware. We recommend using Reimage – it is a well known and professional tool to keep your computer safe. I noticed a lot more advertisements on my screen recently. It seems suspicious to me. Some of them suggest to click to get free software updates and some of them ask to click and fill a survey to receive a prize. I see a small text behind these ads, „Ads by Ayoora“. Is it safe to click on these? Or should I ignore them? If you have noticed such content, it means that you already have Ayoora virus in your computer. You should definitely keep your cursor away from these ads, as one click may result to redirection to a malicious website, or an automatic install of infection for your computer. You should uninstall Ayoora ads in order to avoid such infections. I have recently installed a free program from the web, and I have noticed that my computer works a lot slower now. I uninstalled that program, but my computer performance hasn’t improved. What should I do? It is very likely that with the freeware you also installed extra bundled programs, like Ayoora. Such programs are likely the main cause of the slowdown. Below this article we suggest several methods on how to remove Ayoora virus. Here, look for Ayoora or any other recently installed suspicious programs. Wait until you see Applications folder and look for Ayoora or any other suspicious programs on it. Now right click on every of such entries and select Move to Trash. When in the new window, check Delete personal settings and select Reset again to complete Ayoora removal. Once these steps are finished, Ayoora should be removed from your Microsoft Edge browser. Here, select Ayoora and other questionable plugins. Click Remove to delete these entries. Now you will see Reset Firefox to its default state message with Reset Firefox button. Click this button for several times and complete Ayoora removal. Here, select Ayoora and other malicious plugins and select trash icon to delete these entries. Click Reset to confirm this action and complete Ayoora removal. Here, select Extensions and look for Ayoora or other suspicious entries. Click on the Uninstall button to get rid each of them. Now you will see a detailed dialog window filled with reset options. All of those options are usually checked, but you can specify which of them you want to reset. Click the Reset button to complete Ayoora removal process. This entry was posted on 2015-09-28 at 23:43 and is filed under Adware, Viruses. You can quickly scan the QR code with your mobile device and have Ayoora ads manual removal instructions right in your pocket. How did you remove Ayoora ads?